Before you commit towards purchasing any piece of land in Nigeria, it is important to do your due diligence by checking that the sale of the plot(s) is a genuine sale, otherwise your story might turn to “had I known”. What exactly do I mean by due diligence? Due diligence means that you will need to carry out an investigation of the business(s) behind the sale, the alleged owners of the property, and also the property itself before you make the decision to transfer any money and sign a contract. This might seem like a lot of work, but it is important work because anything negative that you uncover will go a long way towards protecting you from being defrauded. you may reveal hidden costs or unpaid fees like accumulated land use charge, tax etc. you may find that the actual size and topography of the land in question are different from that advertised. investigations will help to verify the real owner of the land. you will also be able to uncover whether a property is located in a location void of government acquisition. If you are dealing with an estate developer, ensure that the property you are purchasing is within the estate. If you are buying from an individual or company, it could be that means the property was purchased with an intent to resell, or perhaps it was no longer fit for the purpose. Buying directly from the family who claims to own the land is actually the trickiest of the three because it can be quite difficult to pinpoint the key figure who has authority to sell the land. You may also have difficulty obtaining documents to prove ownership of the land, and this can be quite risky. Without documents showing ownership of the property, the buyer has to rely on the word of a seller whom you do not know. Decide on what sort of land you want. Once you find a property for sale, visit the location of the said plot to confirm the size and condition of the plot. Think about your budget. Land prices vary with location – for example, a plot in Ikorodu will be priced differently from a plot of the same size in Lekki. Check to see if the payment of land use charge by the owner of the land is applicable. Most pieces of land with C of O (certificate of occupancy) in Lagos state attract this charge on an annual basis. Check surrounding properties and gauge their prices against the price of the property your are interested in. Assess the land further to discover its price in relation to others in the surrounding. 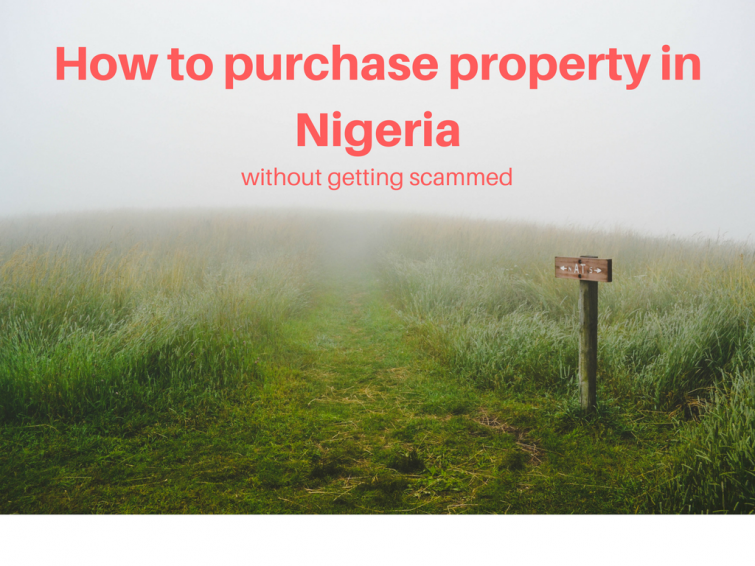 Here are vital documents to ask for when purchasing land in Nigeria. This should be quite straightforward unless you are purchasing from a family. If this is the case, after payment for the plot, a family receipt from the authorized family head is issued and you need to ensure that this is witnessed by the family secretary and a key family member. The receipt must bear the family name that is selling the land, date of purchase, location of the land, the amount paid and family address and also the receivers name (the buyer). This is applicable when you are purchasing a piece of land from an individual or a company. A survey plan shows all the beacon numbers, plan number, the name of the qualified surveyor who carried out the survey as well as the year the land was surveyed. You will also need proof of lodgment of the red copy to the office of the surveyor-general. The layout Plan is a drawing that shows the arrangement of the lands/houses and roads in that area. Power of Attorney is a legal process which gives another person (nominated by you) the power to act as your legal representative if you are unable to make a decision (perhaps if you reside outside the country). This is a document that shows the historical parties to the agreement. It basically traces the history of how the land has change hands up to the present owner. With family purchases, it must also include the names of the members of the family who sold the land, family head and at least a principal witness. It must be duly signed and stamped by the concerned parties. You have probably heard of this before. A C of O is always issued by the authorized government office. This document proves that the new owner has the right to occupy and use a specific piece of land described in the document in accordance with the survey description of the location under certain terms of the contract. prevents a situation where a single property is claimed by multiple owners. proves that the person named in the document is the exclusive owner of the land. it is a very crucial document during mortgage transactions. it is widely used to resolve land disputes that arise from ownership tussles. it is accepted as a security or collateral for loans from banks and other financial institutions. What about registering a land at the town planning office and being issued an instrument number as they call it? Is it also vital? Needed to put you this bit of word to help thank you as before on your superb principles you have shared on this site. This has been certainly unbelievably open-handed with you in giving unhampered all that a number of us would’ve distributed as an e book to end up making some money on their own, principally now that you might have tried it in case you decided. The techniques as well worked to be the great way to comprehend some people have similar desire like mine to figure out a good deal more around this issue. Certainly there are millions of more pleasant instances up front for individuals that read your blog post.